This plant got its name from the intense odour of the flowers which was described as goat-like (Latin “hircus” is he-goat). It is vigorous and 20 to 90 cm tall. The 4 to 6 strong foliage leaves are unspotted and formed as a basal rosette. The cylindrical inflorescence consists of 20 to 80 flowers, each one supported by a long bract. The spur is directed downwards. 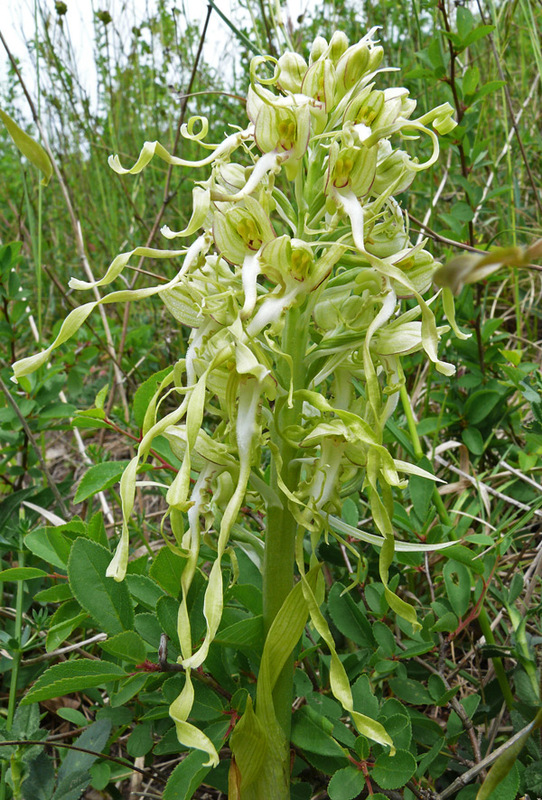 Petals and sepals form a hood above the extremely long and three-lobed labellum which is swiveled like a corkscrew. In 1753, Linné described the orchid as Satyrium hircinum – Satyrium is still the name of an orchid genus in Southern Africa. Its actual name was given by Kurt Polykarp Joachim Sprengel (1766-1833), the director of the botanic garden in Halle, Germany, in his opus Systema vegetabilium (1826). The standard colour of the flowers is green-yellowish with dark red stripes in the hood and spots on the labellum. The rare albiflora form is just white and green without any red or crimson colour. Himantoglossum hircinum is growing in neglected grasslands up to 1800 m. Bloom is from April to July. The thermophile species can be found in the Mediterranean and in Southern Germany.